An abundant variety of fish, some of the world's most pristine waters and more than three million lakes, 3,000 rivers and 6,640 miles of coastline all combine to put Alaska at the top of just about every fisherman's dream destination list. Whether you want to hit up a late run of silver in a freshwater stream, head out to the deep sea for halibut, or have an all-inclusive lodge experience, Alaska has something for every angler. While Alaska provides year-round fishing opportunities, mild weather from April through October makes those the most attractive months. Where your Alaskan fishing adventure begins depends on what you're angling to catch. Alaska has a wide variety of fish species, but salmon and halibut are undoubtedly the state's biggest draw. Salmon is one of Alaska's most popular sports fisheries, and opportunities are plentiful to catch any one of the five species throughout the state. The salmon season begins in early spring, when the king salmon (Chinook) make their way home to spawn. Sockeye (red), pink (humpy's) and chum (dog) follow through summer, with silver (coho) making a late run through the fall. With few exceptions, salmon can be fished from shore, using regular rod and reel or fly-fishing rods and ties, or by boat. Southeast Alaska: In Southeast Alaska, which includes Juneau, Ketchikan and Sitka, king salmon fishing is restricted to salt water, but Alaska's other four salmon species can be fished in salt or fresh water. Kenai Peninsula: The Kenai Peninsula, which includes Kenai, Soldotna, Seward, Homer and Kodiak, an island on Alaska's southwest side, has both fresh and salt water opportunities for catching all five of Alaska's salmon species. Cordova: If you want to try for the famed Copper River red salmon, prized for its high fat content, gained before swimming 300 miles upstream to spawn in the Copper River Valley, head to Cordova, a small, Southcentral Alaska community accessible only by air. If you want to land a halibut or other deep water fish, such as rockfish or lingcod, you'll have to head to the open waters these large bottom feeders call home. A fishing charter is your best bet, since you will need not only a boat to get out on the water, but heavier than normal gear as well. Kenai Peninsula: Halibut and rockfish are abundant along the Kenai Peninsula, particularly Whittier, Homer and Seward. Southeast Alaska: Although catch limits in Southeast Alaska have decreased in recent years (in 2014 anglers are limited to either one halibut under 44" or one over 76" per day), that's still a whole lot of fish. One fish in the 44" range will yield 20 pounds of meat to take back home. Rainbow and steelhead trout are freshwater fish abundant throughout Alaska. Trout can be caught in streams using traditional or fly-fishing rods. Southcentral Alaska: The majority of rainbow trout are harvested in Southcentral Alaska. Southeast Alaska: Steelhead trout are abundant in Southeast Alaska. 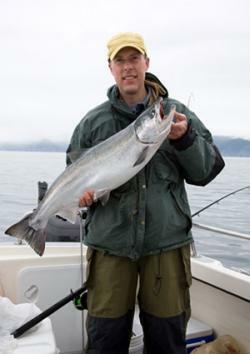 If you're new to Alaska sports fishing, or simply want to do nothing more than reel in that trophy sized salmon or halibut, a fishing charter is a great option. Charters are run by experienced guides and provide everything you need - license, boat, gear and most important, know-how. Guides have their own favorite spots, so you'll get a truly unique experience. All you have to do is sit back, relax and reel the fish in. Safari Lodge: The tiny town of Seward, located on Resurrection Bay, is home to world-class salmon, halibut and lingcod fishing. 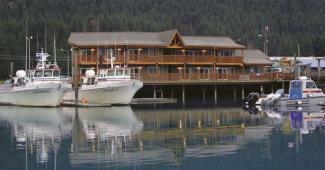 There, Saltwater Safari Company's Safari Lodge offers salmon, halibut or combination daily charters. Fisherman's Choice Charters: Just a 90 minute drive from Anchorage brings you to the Matanuska-Susitna Valley, which is where you will find Fisherman's Choice Charters. 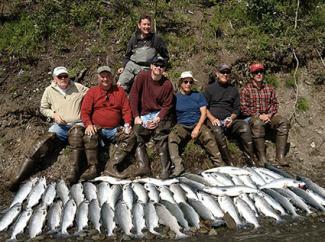 Voted the Mat-Su Valley's best Alaskan salmon and trout fishing charter 12 times between 2000 and 2012, Fisherman's Choice Charters offers guided salmon and trout fishing charters, as well as fly-fishing trips for trout. Rum Rummer Charters: In Southeast Alaska, Rum Runner Charters in Juneau offers half and full day charters for salmon and deep water fish. Full day charters are recommended when fishing for halibut and other bottom dwellers, such as rockfish, as these fish live deep and reeling them in can be a fight. If one day of fishing isn't enough, Alaskan fishing lodges provide an all-inclusive, multi-day experience. Lodges also offer the option to fly in to remote destinations, reachable only by air, for a once-in-a-lifetime opportunity. Tim Berg's Alaskan Fishing Adventures: Located in Soldotna on the Kenai Peninsula, Tim Berg's Alaskan Fishing Adventures offers fresh and salt water fishing for halibut, salmon, lingcod and rockfish. Featured on several national fishing shows, this lodge offers a variety of fishing packages, as well as luxury accommodations, in a beautiful setting. Kodiak Adventures Lodge: For a truly Alaskan experience, Kodiak Adventures Lodge offers three to six day salmon and halibut fishing charters in a remote wilderness setting. 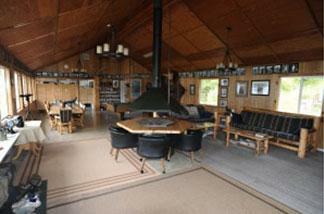 Accessible only by float plane, the lodge is 50 air miles south of Kodiak. It can accommodate only up to six guests, allowing you to get away from the crowds. Of course, you can always nix the charters and lodges and head out on your own. Fishing spots are often an easy walk or drive from town. Participate in what's known as "combat fishing" at Ship Creek, just a short walk from downtown Anchorage. You'll be elbow-to-elbow with tourists and locals alike as you try for salmon. The camaraderie can't be beat - and you just may pick up some pointers from locals. You can even rent gear from The Bait Shack. The Homer Spit is one of the few spots where you may be able to land a halibut from shore. In Juneau, you can fish for salmon from Wayside Dock, about a five minute drive from downtown. The salmon that run through are returning home to spawn at the nearby DIPAC Hatchery. If you want to get out on the water, you can rent a boat or skill from local rental companies. Some of the large charters, like Miller's Landing in Seward, also rent bare bones skiffs. If your Alaskan fishing adventure doesn't include a charter or lodge, you will have to get your own fishing license and your own gear. All resident and non-resident Alaskans age 16 and older must obtain a fishing license. In addition, a King Salmon Stamp is required if you intend to fish for anadromous king salmon (salmon that travel from the ocean to rivers in order to spawn). Licenses and stamps can be purchased from the Alaska Department of Fish and Game website, most sporting goods stores and at local Fish and Game offices. Make sure you plan ahead if you purchase online, as king salmon stamps cannot be printed. The cost of a nonresident sport fishing license ranges from $20 for a one day license to $145 for an annual license. King salmon stamps range from $10 for a one day stamp to $100 for an annual stamp. Gear is dependent on the type of fish and where you plan to catch them. Personal preference and fisherman lore also play a role when it comes to selecting gear. As a general rule of thumb, the larger the fish, the heavier the rod and line you'll need to ensure you reel the fish in, and not the other way around. Unless you're flying straight in to a remote fishing spot, you can stop by any sporting goods store to purchase what you'll need for the trip. Alaska has a wide range of chain outdoor shops, like Cabela's, REI and Bass Pro Shops, as well as small locally run stores. Chain department stores such as Fred Meyer and Wal-Mart also have a large selection of gear to purchase. If you don't plan to use the gear again, or don't want to carry it back home, rental options are also available. Also check with local sporting goods stores about rental options. Whether you think salmon is king or that halibut is poised to end its reign as Alaska's most prized fish, Alaska is a fisherman's paradise. A once-in-a-lifetime fishing opportunity awaits, and is limited only by your imagination.